A big Happy 40th Birthday to Virago today! I wonder if Carmen Callil knew forty years ago Virago books would be being read by all walks of life all around the world? It seems almost rude to say, yet I am going to say it anyway, that Virago is actually that young as in my head it has been going much, much longer. Giving it some thought this is probably because with Virago Modern Classics it publishes books from pre-1973, indeed in some cases pre-1900. 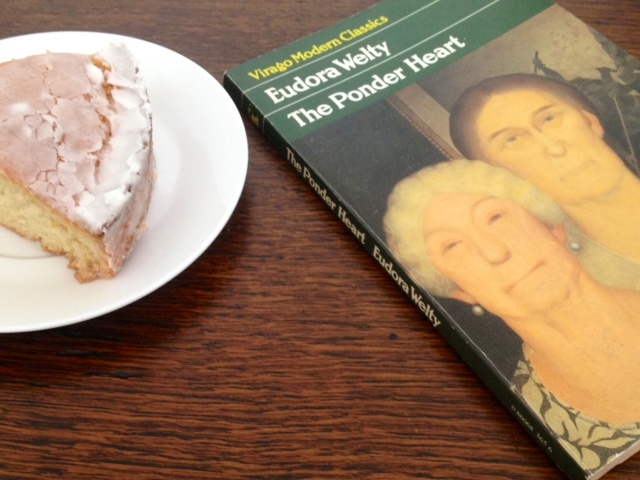 One such book is ‘The Ponder Heart’ by Eudora Welty, an author I have been recommended several times, which was first published in a magazine 1953 (so it could be its 60th birthday) and I decided that I would read to celebrate today. How could I not have cake on Virago’s 40th Birthday? Edna Earle’s Uncle, David Ponder, is one of the richest, nicest and possibly simplest people in the Mississippi town of Clay. He has become renowned for his almost stupidly kind levels of generosity; he simply cannot stop giving things to people. Edna is an example of this herself when he gives her a hotel on one of his many whims. He even tried to give away his own cemetery lot. His whims lead him to being confined to an asylum by his own father, though he never stays there long as he is so lovely to the staff and can’t be certified, and also to rash ‘possible’ marriages. His first with local widower, Miss ‘Teacake’ Magee, leaves them both unscathed, however when there is a new arrival in town far beneath the Ponder families social circles you know everything is about to change. “Meantime! Here traipsed into town a little thing from away off down in the country. Near Polk: you won’t have heard of Polk – I hadn’t. Bonnie Dee Peacock. A little thing with yellow, fluffy hair. Alas she isn’t carried off by the wind but something does indeed happen, what that is of course I cannot say as it was a twist I wasn’t expecting. So what to say of ‘The Ponder Heart’ as it is a tricky one as I was often as bemused by it as I was entertained and I think this might all be down to the voice of Edna herself. You know when you are having a bit of a conflab/gossip with one of your closest friends and you wander off on various tangents which make the story you are telling them break up, restart, skip bits and go back again? Well this is exactly what Welty does with Edna as she tells you of her Uncle’s tale first hand, almost, often going off on tangents about something completely different though related in some slight way. I was actually wondering during the book if I was one of her friends who had popped in for a coffee at Edna’s hotel, one of the staff she gossiped with or indeed one of the clientele, though as she doesn’t think too highly of them it is unlikely to be the latter. This is the other clever, but also slightly alienating thing that Welty does with Edna, sometimes you really don’t like her thoughts on the world. To the modern ear any mention of the ‘Negroes’ that she hires and thinks she is doing a favour will make you wince a little, yet Welty’s background was from Mississippi and you know she is retelling you people’s actual thoughts at the time from those places. Edna, or someone like her, would have existed. This for me slightly took away the element of comedy in the book, and some parts are very funny and farcical, and also strangely aged it. Yet Edna couldn’t help but win me over with her frankness and the sense of her confiding in you so makes you almost feel like a really special confident. I don’t think any book, or rather narrator has done this in such a realistic way and I really admired Welty’s prose for that. ‘The Ponder Heart’ is a curiously unusual, quirky and odd novella. In some ways I thought it was absolutely genius and in other ways I thought it was a rather bonkers and confusing, if delightfully so, telling of a family and town that said a lot about class and society at the time yet didn’t really know where it was meant to be going. I was baffled by it on occasion but I couldn’t help being charmed so much by Edna’s gossipy tone no matter how much I wanted to tell her to stop being such a snob. A real mixed bag of a book all in all, yet one worth spending a few hours with nonetheless should you end up with a copy. I wonder if all Welty’s books have this unusual tone, I will have to try more to find out.